The prettiest way to wear color is hazy, washed-out and intentionally imprecise. So far, it seems makeup artists are taking their titles quite literally this season at New York Fashion Week. Diffused, watercolor-like eye shadow in an array of bright and pastel hues is one of the recurring beauty trends from the shows, and artists have been experimenting with a number of different techniques, formulas and finishes to each put their own stamp on the style. The results are dreamy and whimsical, ranging from runway-only-zany to completely-wearable-in-real-life. And yes, they just may convince you that periwinkle makeup looks good on everyone. Eckhaus Latta has shown artsy makeup on its runway before; last season, it was fingerpaint-like splatters of pigment down models' faces. This time around, makeup artist Isamaya Ffrench achieved a more diffused, watercolor effect by literally airbrushing MAC pigment onto (and around) models' lids. Intended to mimic the tie-dye that appeared throughout the collection, the hues ranged from rich jewel tones to sunset-like reds and oranges. Tie-dye-meets-watercolor eye shadow also appeared at the Collina Strada show, where makeup artist Takeda Rena layered various shades of Shiseido's Kajal Ink Artist Shadow - which are meant for scribbling and blending and even come with a built-in, sponge-tip smudger - together. While not every model at Sies Marjan wore painterly eye makeup, most of them did sport slightly shimmery teal shadow paired with sky-blue eyeliner, the handiwork of makeup artist Thomas de Kluyver. To get the look, he combined MAC's Chromagraphic Pencil in Hi-Def Cyan with the brand's Art Library Palette in It's Designer, which will launch in the fall. He used his finger to smudge and smear on the product, inspired by the notion of a "teenage girl playing around with makeup in her bathroom," and channeling a sense of nostalgia. Cassandra Garcia, who keyed the makeup at Tibi's Fall 2019 show, also went for a slightly messy, undone effect, drawing inspiration from "the perfectly imperfect look of slept-in makeup." She described the look - which featured Bobbi Brown Luxe Eye Shadow in Poison Ivy, or "watercolor green," as she put it - as "something cool and different." 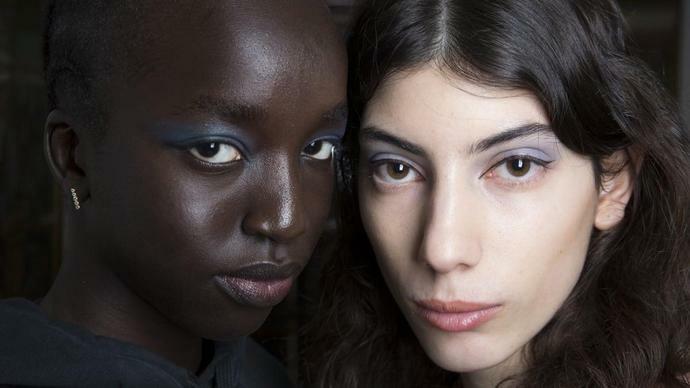 The look at Maryam Nassir Zadeh (shown above) also centered on a singular eye-catching shade: a hazy periwinkle blue, courtesy of Nars Duo Eye Shadow in Rated R. Though the powder formula appears to be a vibrant, intense cobalt in the pan, makeup artist Farah Homidi diffused it, giving the impression of an ethereal halo of color that extended past the eye crease, becoming more sheer as it reached the brow bone. To prevent the look from being too abstract (and to keep models' eyes from getting lost under all that blue shadow), Homidi drew a super-skinny, precise black line of Clé de Peau Intensifying Cream Eyeliner on the top lids only, starting at the inner tear ducts and extending out into a slight cat-eye flick. "No need for mascara. The eyeliner is the mascara," she said of the look. Click through the gallery below to get a closer look at the artsy makeup moments from this season's New York runways.